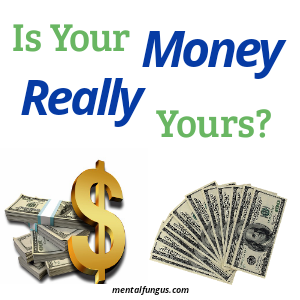 Is Your Money Really Yours? Or Are You Just a Custodian? Do You Really Own Your Money? The money that you own is actually not yours. Just try to look your money in a different way. Most of us see money, which is in our pocket or in our bank as something that belongs to us because we earn it by our hard work and intelligence. This is a very common belief that we have about the wealth we own. There is no problem in thinking this way. You have really earned it with your determination. Off course you have all the right to enjoy your wealth and call it mine. But this belief that you have about money is very shallow. Having such belief comes with a lot of narrow mindedness. A person with such belief about money and wealth is bound to be ruled by money. He cannot be free from money. All his activities related to money will be influenced with this idea to accumulate as much money as he can and by any means. Because for him money is something that defines him. The more money he has the more he will feel honored. For such a person parting with his money will be something that he will hate. He will spend his money only on himself. For him giving gifts is the least favorite thing in this world because when you give gift someone you don’t spend your money on yourself. What I want to say is that try to look your money as something you don’t possess or own but instead. Think of this wealth and money given to you as a custodian. You are nothing but a channel by which this money will go through. You are just an intermediate and nothing else. You are just a part of this long chain by which money goes through. The money that you have right now, it doesn’t matter if it is millions or a few hundred, is going to part with you at some time. When you spend the money it will go to someone else and it keeps going on and on like that. It’s just a matter of time for how long you are going to keep that money and also the amount of money is going to be yours. Soon it will be in someone else pocket or bank. And nobody will keep it forever. Once you realize that you are just a part of a chain you calm down. This realization teaches you a great lesson of being patient and non-possessive. You realize that the very nature of money and wealth is “moving”. You began to see wealth and money as something that comes and go and there is no possibility of owning something that has the nature of “flowing”. Personally speaking when I realize this. I find a huge change in my mentality towards money. I don’t have a huge wealth but whatsoever money I have I am very much satisfied with it. One major and crucial change I have seen in me is that now I don’t bother much about expenses. it’s time to pay that money back. So there is no reason for me to feel frustrated by sudden unexpected expenses that I have to pay. I feel by this way of thinking, I began to take things positively rather than being control by the lure of the money. One more positive aspect this belief brings to life is, the less you feel agitated by expense the more you develop this belief that money will come from other unimaginable sources. because if you are holding money that just temporarily belongs to you and going to part with you then others are also holding some money that will eventually come to you and will go away from your hands too. So if you think that the money you have will only be spent on you then you are mistaking. This article is not suggesting you to get focused on the expenses before the money comes but rather be more flexible to this belief of being the owner of your money. This new way of thinking about money will help you when any an unforeseen expense will arise. For most of us these unanticipated expenses shake-up the budget that is why we hate it. But if you look it as if you have already earned the money that is going to cost you now this will make life little easy at least on monetary matters.